Laotian or north Thai salad - you have to try it ... delicious! Larb is most often made with meat, poultry or seafood, flavored with fish sauce and lime. It is mixed with chilli, mint and, optionally, assorted vegetables. 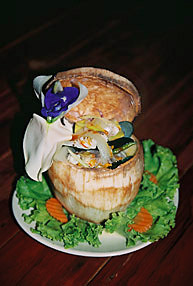 The dish is served at room temperature and usually with a serving of sticky rice. ... and many more you will find in our menu in the restaurant.